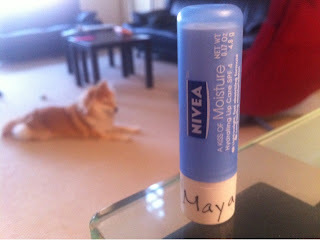 After two dog park visits and a hike in the woods over the weekend, Maya seems to start itching a bit again yesterday. I guess we pushed it a bit too far. For now, it's kind of manageable, so I'm still debating whether to give her Atopica or not. I also started to wonder, whether wiping her face after every walk is drying out her skin and makes her more itchy. With that in mind, I started to look for some "edible" body lotion, and the idea of using a lip balm came to mind. I've been eating it everyday myself after all. So far I'm very pleased with the result. Every time I see her scratching, I apply a bit on her snout and she'd stop for a few hours. After trying so many things over the months, it's nice to claim that something actually works. How spoiled is Maya? I have a good collection of lip balms I don't like sitting there collecting dust, but I gave her my favoriate one.